INVISIO in-ear-headsets in combination with a control unit act as intelligent hearing protection. They provide outstanding passive hearing protection, supplemented by an automatic level dependent protection so that they can also function under extreme conditions. The passive protection, in the form of replaceable ear-plugs, reduces all sounds in the user’s surroundings and is mainly intended to protect against hearing loss that may arise as an effect of high noise levels over a long period. The active electronic protection in the control unit helps against both continuous noise over long periods and sudden acoustic shocks and reduces them immediately. 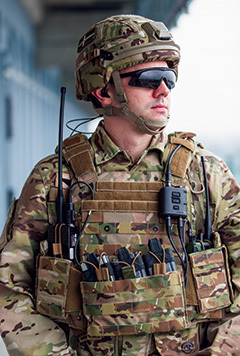 The system can attenuate continuous noise from aircrafts with up to 32 dB (SNR), or acoustic shocks from grenades with up to 52 dB(C) Harmless noise reaches the ear unchanged, almost as if the wearer were not wearing a headset. The complex shape of the outer ear is a major factor in allowing people to tell where sounds are coming from. How the sound bounces on its way into the auditory canal determines how you perceive direction. To be able to perceive sounds in your environment correctly when wearing hearing protection, INVISIO’s headsets have special microphones on the outside. The same system can also amplify sound in the environment up to three times, to be able to hear things that a human ear does not normally perceive. The headset must amplify sound up to 80 dB(A) in a natural way, but reduce harmful acoustic pressure so that the volume from the speakers never exceeds 85 dB(A). One of the greatest challenges in developing headsets for noisy environments is to shut out the surrounding noise while hearing speech clearly. When we speak to each other, the noise of our voices moves in the form of sound waves through the air. Since most things in our surrounding environment generate or reflect sound waves, our voices must compete with many other sounds in order to be heard. INVISIO’s Bone Conduction technology solves the problem with a microphone placed in the ear, which transfer vibrations from the jawbone. Thanks to advanced electronics, speech is clear and comprehensible. he speaks. The vibration is then picked up from the jawbone through a specially developed microphone. The signals then travel through an advanced filter to be converted into clear speech. The construction of the Bone Conduction microphone and its location inside the ear blocks surrounding sounds and only transmits the wearer’s voice to the communication radio. Denmark has a long tradition of world-leading technology in hearing and acoustics with products from hearing aids to headsets and loudspeakers. The Copenhagen region is now considered to be one of the world’s leading clusters in the fields of acoustics, hearing and mobile communication. Danish researchers have spent several decades building up world-class knowledge of acoustics and hearing thanks to a deliberate focus on offering advanced hearing aids for everyone. Three of the world’s top manufacturers of hearing aids are Danish. Universities such as the Technical University of Denmark are known to be some of the best in their field in the world. INVISIO originated from this tradition. INVISIO’s engineers come to the company with many years’ experience from the Danish audio research and industry.